It is the most versatile piece of equipment for your operatory. Velopex International’s AquaCare is an ideal tool for Restorative Dentistry, MID, Endo, Ortho, Implants, Pediatric, Perio and Hygiene procedures. 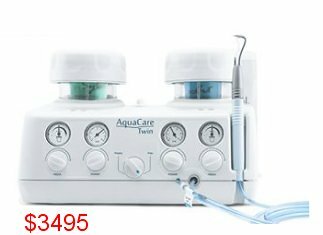 With no direct contact with the tooth structure, AquaCare produces no vibration, turbine noise, heat generation, or smell, and it greatly reduces the need for local anaesthesia. In cleaning mode, the AquaCare is a valuable tool for the hygienist, delivering highly efficient stain removal and cleaning. It also increases the effectiveness of tooth whitening procedures. 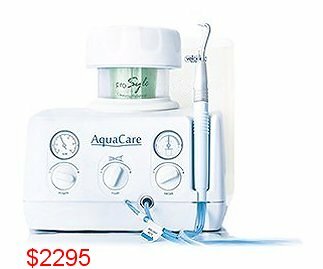 The AquaCare patented handpiece [less than 1oz] gently delivers a fluid stream, supplied from an inverted bottle delivery system, creating a liquid curtain around the procedural medium. This provides for comfortable and efficient cavity preparation and cleaning. A 3-in-1 foot control ... Our triple-action foot control enables cut, clean and wash/dry operations to be carried out through the same handpiece, allowing continuous operation without interruption. The AquaCare Twin permits cutting and prophy/stain removal at the twist of a switch. For example, suspicions concerning an area of possible decay can be confirmed with the AquaCare Twin in cleaning mode, and then treated by switching back to cutting mode. 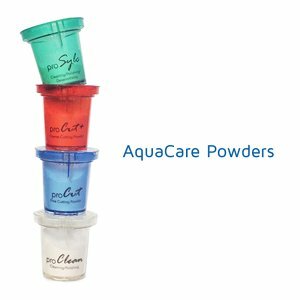 Velopex International has developed an exclusive method of packaging its powder media in a specifically designed cartridge. The shape of the cartridge has been created to ensure that the air passes through the media allowing for maximum separation of particles and the deliverance of kinetic energy through to its handpiece. Each cartridge also has a unique color so you can quickly identify the media you wish to use. What will you use today?